My parents think I live this “Gypsy Chef Life”. I couldn’t imagine a better career, to be honest. It’s been 5 years since building “BeetzEats”. I’m independently contracted with other chefs and caterers while building my brand, and drop it all to cook for Simon when he’s back in town. I travel a LOT. Maybe too much… but I’m always being exposed to new things: New events, new menus, new styles and techniques. Being exposed to a different perspective gives you such a leg up in this rapidly-evolving, fire-breathing, monstrous industry. I’m sure you’ve all watched Food Network’s “The Pioneer Woman” . Ree Drummond, she lives in Pawhuska, about an hour away from where I am. I was here a few weeks ago just after Thanksgiving and went to her new restaurant “The Mercantile” to check it out. Great spot! Reminds me of Cracker barrel only in the fact that it’s bottom floor is more than half gift shop. Full of trinkets, kitchen-ware and her cookbooks. The upstairs in a cute little coffee shop, with a glass-walled bakery towards the back where you can watch the Bakers hard at work making cheesecakes, buttery croissants and everything else old-school fudge and pecan pie related! The food was good. Simple… nothing crazy or fancy. Just tasty food. Nothing I can’t do? Right…? Makes you think. They say she always has a line out the door! They say she feeds over six thousand people a day! What??! Pawhuska has only three thousand people living in it! Smh…. This recipe has a few parts to it. Make things easy on yourself and break it up. Make your pasta dough and fill tortellini ahead of time. Roast the chuck and shred it the night before! That way you can whip it together in a snap. OR you can be like me and spend 4 hours lazy-ing around the kitchen getting it all done on your own time. Beef Chuck is a cheaper cut of meat. It’s perfect for this recipe and for anytime you want a Roast. You’ll get that shredded fall apart in your mouth that you’re looking for as long as you braise it in the oven for a good few hours to let it breakdown. Poke 8-10 deep holes with a knife and shove whole cloves of garlic into the meat. Season the roast with salt and pepper and sear it in a pan. Browning all sides of the meat to develop a nice golden crust. Place the roast in a baking dish (I used a bread loaf) and cover with 1 quart beef broth. Cover with foil, and braise in the oven at 375 for about 2 hours. When the roast shreds apart with a fork, its done! Shred meat and let it sit back in it’s liquid until you’re ready to use it. Put flour and salt in the mixing bowl of a kitchen-aid standing mixer using the dough hook, add eggs one at a time mixing until fully incorporated. Drizzle in olive oil, mix until ball forms then turn out onto floured surface and kneed the dough with some additional flour until its shiny, soft, and elastic. About 5-8 minutes. Wrap with plastic and let rest in the fridge for 30mins – 2 hours. Cut dough into even portions, working in smaller batcher to roll out paper-thin. Using the kitchen-aid pasta attachment makes life easy, i’d roll it out until a 5, but you can old school roll-it-out with a rolling pin too. Use a ring cutter to cut circles about 2.5 inches in diameter. Dollop a quarter size drop of filling in the center and wrap tortellini (seal with 1 beaten egg). I would try to explain “How to: tortellini” but YouTube already does a great job on step-by step for the shape. Cheat Tip #2: If you’re not into the “made from scratch” life, you can just buy pre-made tortellini. Lol But there’s something to be said when sitting in your kitchen for hours rolling, filling, and twisting fresh hand-made pasta. 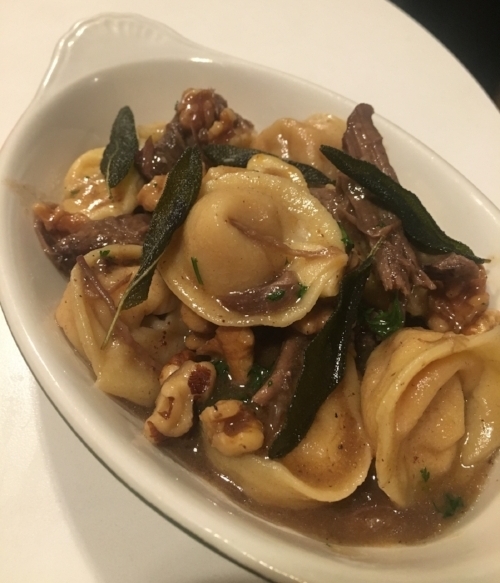 Alright- so we have our shredded chuck roast sitting in juice, and we have our cutie tortellini’s ready to go! I drained the juice from the roast into a pan, seasoned it with salt, pepper, dried sage, and garlic powder. Made a slurry (2 Tbsp cornstarch mixed with 2 Tbsp COLD water) and poured that in. Bring the sauce to a boil and let reduce/thicken until it becomes gravy-like consistency. In another pan I made some Sage brown-butter. Heat ½ cup unsalted butter with fresh sage leaves in a pan until it browns and turns caramel colored. It will develop a nutty, buttery flavor and the safe leaves with crisp up. Remove Sage leaves and reserve for garnish in the end. 1.To the gravy, add some shredded chuck and the chopped walnuts. 2.Boil tortellini in a large pot of boiling salted water. Strain pasta and toss into saucepan with gravy/chuck/walnuts. Toss to coat & plate. Drizzle with brown-butter and garnish with crispy Sage. From my hungry belly to yours, Until we eat again.